Mary joined our team in 2018. She comes to us from working in the schools for five years and before then was in the corporate world for 15 years. She was looking for a career change and explored dentistry through a local university and her interest was peaked Mary has three children; Julianne, John, and Patrick. Mary spends most of her time with family. 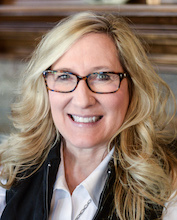 She enjoys attending sporting events and is an avid Husker and Bluejayfan. . You will see Mary’s smile the second you enter CorpuzFamily Dentistry. We are excited to have her be a part of our dental family.